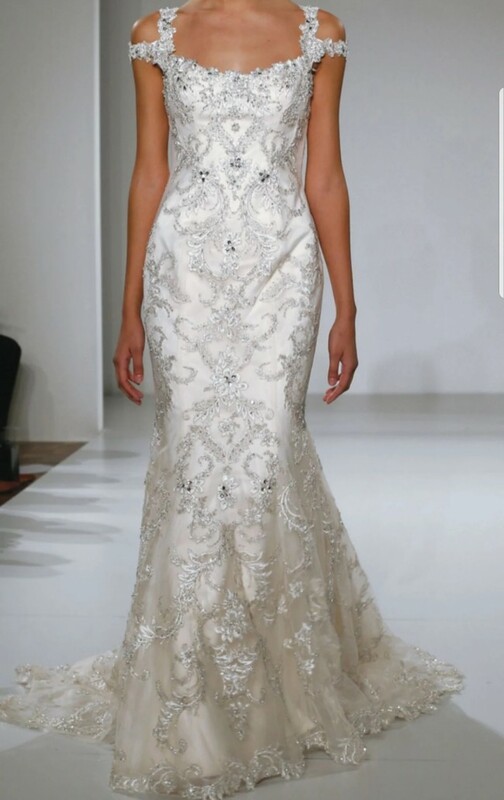 Sottero Midgley Ettienne dress ivory over light gold. Gorgeous dress with lots of bling and beading allover including Swarovski Crystal's at the top and on the sleeves. The sleeves came as an option but I had them sewn on (will be easy to remove per the seamstress). Street size was an 8 but I had the waist let out to a size 10. I am 5 ft 6 160 lbs with. 36C chest and the dress fit me perfectly. Dress has a 3 point bustle that the seamstress added. Smoke free home. 3 point bustle, cap sleeves sewn on, 1 inch let out in waist/hips.